우분투를 사용하면서 오픈 오피스에서 일본어 폰트가 정상적으로 보이지 않는 경우가 많아 졌습니다. 윈도우상에서 작성된 일본어의 폰트가 msmincho등으로 설정이 되어 있기 때문에 리눅스 우분투에서는 읽지는 못합니다..
우분트 시스템에 폰트를 넣으면 되겠지만 이보다 우분투형 일본어 폰트를 윈도우에서 사용하면 더 좋겠다는 생각이 들었습니다..
서로 빠르게 공유 할수 있으니까요. Takao Fonts are a community developed derivatives of IPA Fonts. The main purpose of this project is to secure the possibility to maintain the fonts by the community. IPA Fonts are high quality Japanese outline fonts developed by Information-technology Promotion Agency, Japan(called IPA for short). It's released under the IPA Font license which allow us to modify and redistribute them on the condition of avoiding to use the word "IPA" for derivatives' name and following some other restrictions (see IPA Font License for detail). 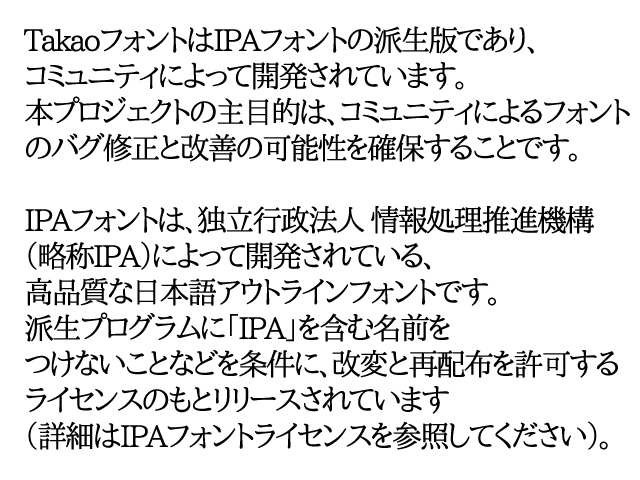 This restriction means that only IPA modify and release the IPA Fonts themselves. It seemed that IPA carefully review their fonts to avoid including odd characters, and so it takes much time until the new version releases. This process is beleived necessary to protect against spreading wrong Japanese characters. But on the other hand this is inconvenient for some products such as community developed operating systems or embedded softwares which are disposed to include high quality Japanese fonts. Because we are prohibited to apply any patch and release them with the name "IPA Font" even if we found bugs on them, therefore we can't guarantee the quality of these fonts. This project is for avoiding this problem with changing their names. We named "Takao Fonts" for our derivatives. "Takao" is from the first name of the late Mr.Takao HAYASHI who is original desiner of TypeBank(TB) Mincho and Gothic which are origin of IPA Fonts. His wife consented us to use this name for ours.